In the four years that Nicole Galase has been studying band-rumped storm petrels on the Island of Hawai‘i, she has worn through five pairs of hiking boots, thrashing their soles on the rough lava fields of Mauna Loa. But Galase isn’t complaining, as the countless kilometers of travel have paid off: she is the first biologist to unequivocally locate these secretive seabirds’ Hawaiian nesting sites, concealed deep in volcanic lava tubes. “Stormies,” as Galase fondly calls the seabirds, are thought to be in decline globally and are officially listed as endangered in the United States. They spend most of their lives far out at sea, ranging across the Atlantic and Pacific Oceans and never touching land outside of the breeding season. They confine their nesting colonies to remote islands and hide their nests underground, coming and going only at night. Ancient bird bones found by archaeologists suggest that the seabirds have nested throughout the Hawaiian Islands since before Western contact, but modern-day evidence of breeding was, until now, circumstantial. While there were reports of nighttime calling, and occasional sightings of adults in breeding condition, or of fledglings, no researcher had ever found nests sheltering eggs or chicks. Back in 2014, Galase arrived at the US Army’s Pōhakuloa Training Area on the Island of Hawai‘i to lead a seabird research project, a joint initiative of the army’s natural resource program and Colorado State University’s Center for Environmental Management of Military Lands. Previous acoustic monitoring showed that band-rumped storm petrels frequented the Pōhakuloa area—a high plateau between several volcanoes including Mauna Loa and Mauna Kea—during the May to November breeding season, yet no one could prove they were nesting there. The 28-year-old new hire’s assignment was to catch them in the act. “That was a daunting task,” Galase says, because the birds are so small—about the size of American robins—and elusive. “I thought there was zero likelihood I would find anything,” she admits. Galase began in 2015 by placing audio recorders at key locations around Pōhakuloa to pick up the storm petrels’ distinctive high-pitched chatter—the inspiration for the species’ Hawaiian name, ‘akē‘akē. The recordings placed the birds high on Mauna Loa’s northern slope, about 2,100 meters above sea level. Galase and a research technician bundled up against the cold and headed out in the dark to search for their quarry. Peering through night-vision binoculars, they identified stormies by their rapid wingbeats and erratic, tilt-and-turn flying style. The excited calls and circling flight patterns of the birds that were still looking for mates helped Galase to zero in on a nesting zone of about four square kilometers. 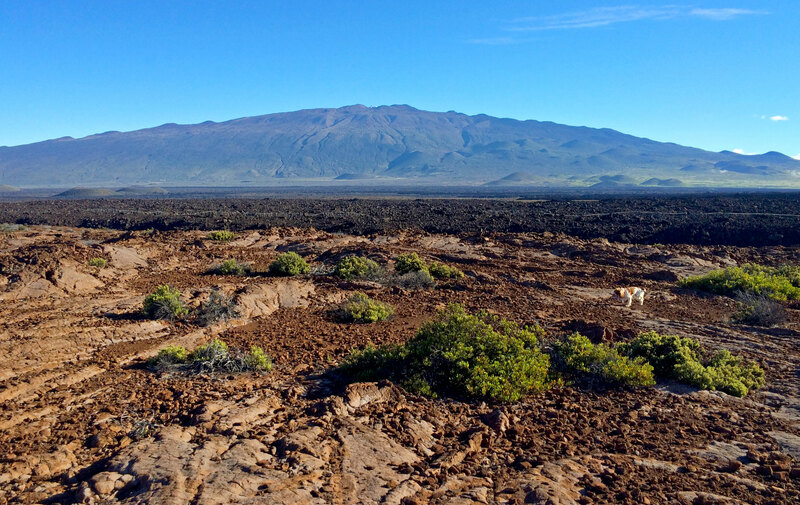 To figure out which openings in the jumble of jagged lava were nest entrances, Galase recruited a keen-nosed springer spaniel named Makalani and his handler. The trio searched in the early morning to beat the heat. Galase was delighted by the dog’s ability to detect seabird scents over distances of up to 100 meters. But even when his nose led to the birds’ hideouts, the occupants remained out of sight and reach. “The lava tubes go in deep,” she explains. “They have small openings, they can get narrow, and the tubes can turn.” So Galase set up motion-activated surveillance cameras to monitor suspected nests at night. In September 2015, Galase bagged several grainy photos of an adult storm petrel at a nest entrance. Since then she has recorded numerous videos, capturing scenes of parents scurrying to and from burrows, a newly emerged chick exercising its wings, and a fledgling heading out to sea, plus footage of a feral cat that killed one of the birds. So far she has documented four nests; this summer, she’ll keep hunting for more. 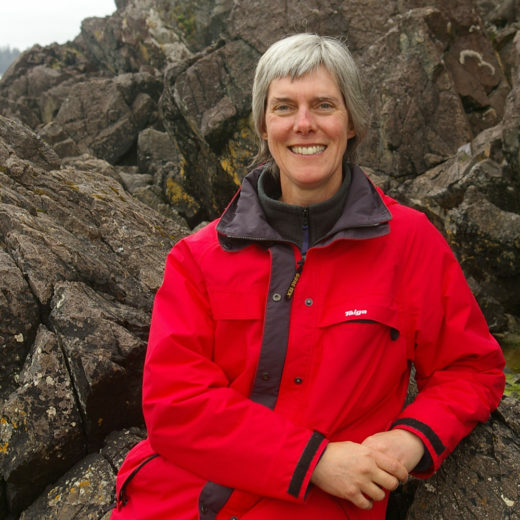 Frances Backhouse is a biologist turned writer who has called the British Columbia coast home for more than half her life. Her work has appeared in Audubon, Canadian Geographic, Canadian Wildlife, High Country News, Nature Canada, Up Here, and other publications. Frances is also the author of six books, including Woodpeckers of North America, Owls of North America, and Once They Were Hats: In Search of the Mighty Beaver. Cite this Article: Frances Backhouse﻿ “Hidden Hawaiian Bird Nests Finally Found,” Hakai Magazine, Mar 20, 2019, accessed April 23rd, 2019, https://www.hakaimagazine.com/news/hidden-hawaiian-bird-nests-finally-found/. Despite years of conservation efforts, endangered marbled murrelet populations are not increasing. These Oregon researchers aren’t giving up hope.